This writing prompt will be near and dear to your students hearts: The Cell Phone. Did you know that the handheld cell phone has been around for over 40 years! 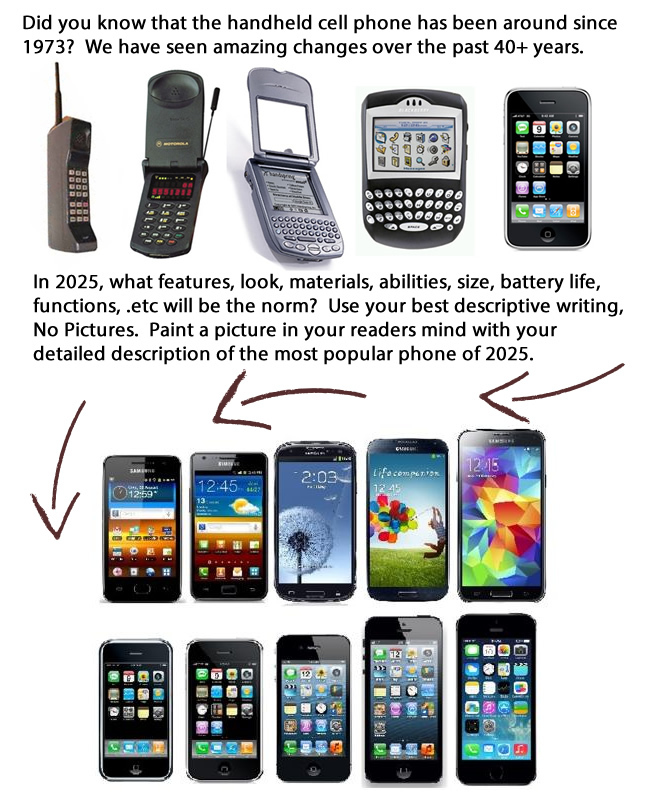 In this writing prompt students are asked to create the “IT” cell phone of 2025. The catch: They have to use their best descriptive writing skills. Absolutely no pictures. An extension activity: Take the writings and make three copies of each. Next, give a copy to 3 students and have them draw the phone as described. This is a great way to demonstrate to students how descriptive they are in their writing. If the 3 drawings look fairly similar then the writing used good description, if not your class will have a good laugh! Another extension: Web Designer Depot has a great blog post on the evolution of the cell phone from 1983 -2009 if you want to go into more detail. Did you know that the handheld cell phone has been around since 1973? We have seen amazing changes over the past 40+ years. In 2025, what features, look, materials, abilities, size, battery life, functions, .etc will be the norm? User your best descriptive writing, No Pictures. Pant a picture in your readers mind with your detailed description of the most popular phone of 2025. The greatest writing prompt ever created!